We stopped at several historical sites and cultural centres on this day. We followed the Klondike Highway from Whitehorse as we made our way to Dawson City. There is so much history on these roads so we made several stops to see some of the stories left behind. The government required a route to connect Whitehorse with Dawson Creek so mail and supplies could be delivered. In 1902 the Overland Trail was built, it was 330 kilometers (205 mi) long and would take a carriage five days to complete the route. The Montague Roadhouse was one of many stage posts on the Overland Trail. They varied in their services to the travellers but they usually all had stables, meals and accommodations. This is actually the third roadhouse built at this site. The original was built in 1900 but burnt down, the second one also burnt down in 1909. This one was built in 1915 and operated until the 1950’s, is still standing but only outside walls of it are left. One of the other roadhouses on the Overland Trail was at Carmacks. Stage drivers would change their horses every 30 – 45 km (approx. 20-30 miles) along the way and Carmacks was a major stop for them. One of the regular stops made by the sternwheelers was at Carmacks in summer. To meet the high demand for wood needed for their steam engines, this meant work for many. Family wood camps were located every 35-65 km ( approx. 20-40 miles) along the Yukon River between Whitehorse and Dawson City, and they supported themselves by selling the wood until the 1950’s when sternwheelers were no longer used to transport the supplies. There are four islands that divide the river into five channels. Only one of these narrow channels is passable. This created very difficult obstacles for the many travellers on the Yukon River when the gold rush was happening but to this day is a challenge. There were steps and a path down to the river but we chose not to go, I think it was about 3 km round trip and many more things to see. We stopped to have a look around this Cultural Center. They had so many original things made from animal pelts like rabbit-skin blankets, moose-skin clothing and boats even a salmon-skin dog pack! A walk out behind looked like a camp may have looked including a pole-house, drying racks and a moose-skin shelter. This centre has the only mammoth snare in the world! Pelly Crossing is home to the Selkirk People. In their old beliefs, it was the crow that made the world, and when he made people, he divided everyone into clans, Crow and Wolf. To this day, the Selkirk Band government is elected on their clan system of the Wolf and Crow. This is a traditional high cache used to store food and supplies out of the reach of animals, restored and moved here for display. They were built to about five feet high and the poles were usually wrapped with tin to keep the little creatures from climbing up to the cache. Many fish camps of the Selkirk band use these to this day. 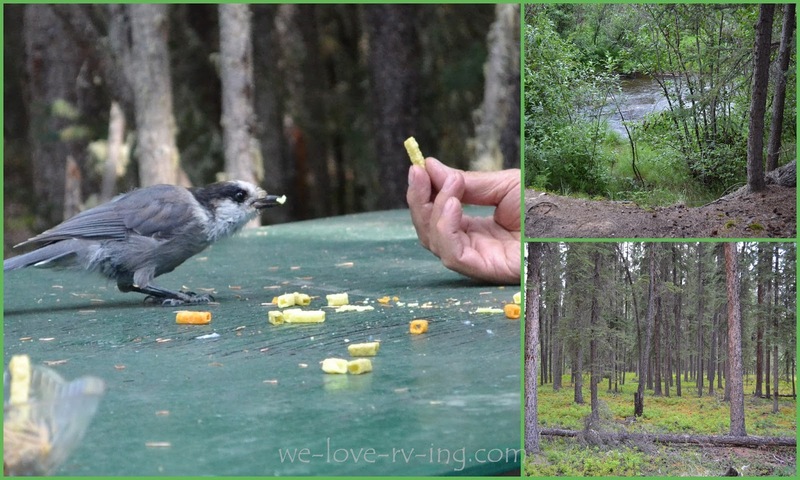 We stayed in the Moose Lake Provincial Park that night and enjoyed a walk down to the creek after dinner but our happy hour visitor was one of many gray jays we met along the way. It takes nothing to get their attention so a few scattered treats was all it took. They’re known to even land on your hand, and although that photo didn’t happen, they did take several pieces from Keith’s hand. The history of this land and its people is so very fascinating. It is wonderful to be able to learn this in such an interesting way and great to know that some of their old beliefs, customs and traditions are still being carried on today.